The holidays are here, again! Which means many of you will be hosting gatherings for family and friends. This leaves you in charge of figuring out what your guests will do to stay entertained during the party. 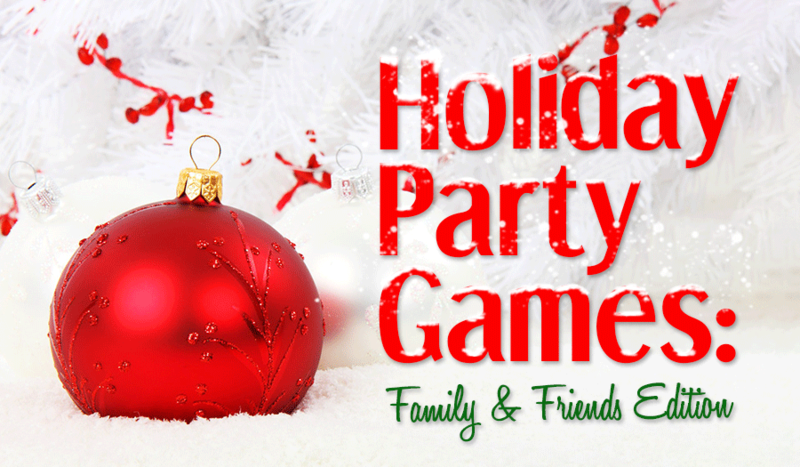 As a kid, our family holiday parties always consisted of games where everyone was involved and could bond. They usually were like Jeopardy or something of that nature. Back then they games seemed a bit boring, I guess as a kid many things seemed boring – but still to this day the holiday party games are a memory that I look back on and smile. If you want to pick some games that are memorable and yet original – stick around because we have 2 games that will have your guests super entertained and loving your creativity. This game is great to break the ice and get your guests laughing, plus it tests your skills to see how well you know someone. 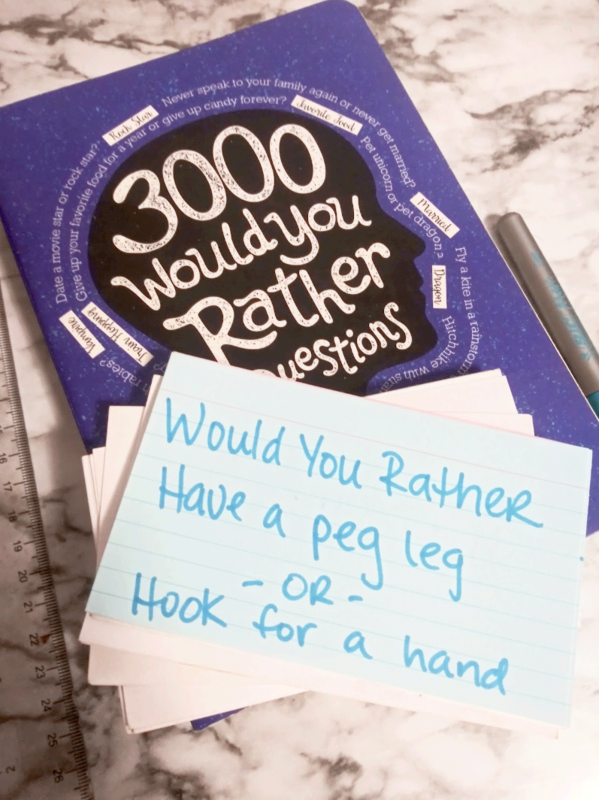 Created around the book 3000 Would You Rather Questions, you are in charge of how funny or serious the questions are. 1. We picked about 3 questions out of the book per person we were expecting at the party. So if you were expecting 5 guests, you would want to pick 15 questions. 2. Next, we wrote 1 question on each Flash Card in Sharpie, until all of the questions were on a card (any pen will work as long as it is bold). 3. Designate 1 Game Host who will be asking the questions. Then you will have guests pair into teams of 2, 4, or 6 and they will pick a Team Captain. If you have a larger group of guests – make sure the teams are larger for time sake. 4. Pick fun Grand Prizes for the ending of the game. The team members who know their Team Captain the best, based on how many matching answers they get compared to their Team Captain win. For every matching answer, your team gets 1 point. The team with the most points wins. Each team gets a turn going up in front of the party. The Team Captain will stand or sit, away from the other members of the group. This is to ensure no one can see the Team Captain’s answers. The Game Host will draw 1 card, and direct the question to the Team Captain. The Team Captain and the Team members will have 5 seconds to write down their answers. For every matching answer to their Team Captain- the team gets 1 point. The teams with the most points win a prize or bragging rights. Similar to the age-old game, Pictionary, but with a new drawing prompts. 1. Pick an assortment of drawing prompts from the 300 options in Sketch This. 2. 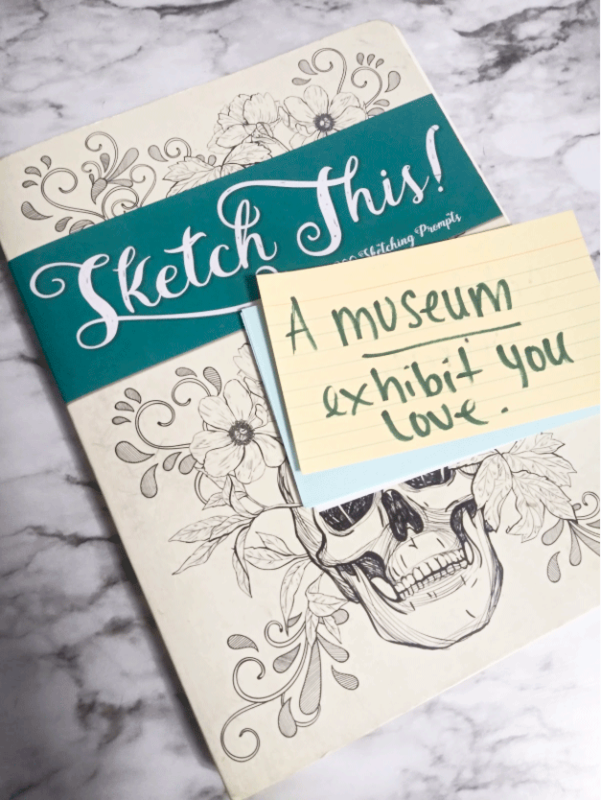 Write each drawing prompt on a Flash Card. 3. Underline the keyword in the prompt, this will be the winning word. For instance: A museum exhibit you love. A museum would be the word the crowd would need to guess. Each person takes a turn picking a Flash Card. They then get 5 seconds to think about the prompt before drawing. The timer is 30 seconds to start drawing and for someone to guess what they have drawn. As the person is drawing, the first person to guess the keyword wins. These are fun twists on classic games that can be tailored to your party. Give them a try and let us know what your party thinks of the fun! Happy Holidays.